Giving young people access to free legal advice in a ground-breaking first in regional Australia has resulted in many positive outcomes beyond helping fix legal problems. 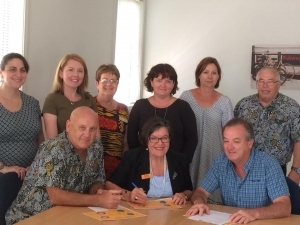 Hume Riverina Community Legal Service (HRCLS) principal lawyer Sarah Rodgers welcomed Federal Member for Indi Cathy McGowan to NESAY on January 11 to meet with all the partners involved in the Invisible Hurdles project. HRCLS has partnered with NESAY, Wodonga Flexible Learning Centre and the Albury Wodonga Aboriginal Health Service (AWAHS) to deliver the Invisible Hurdles project from October 2016 onwards. Ms Rodgers thanked Ms McGowan for showing a strong interest in the project and offering her support in Parliament for community legal centres and initiatives to help young people struggling with life’s challenges. “We appreciate the support from all MPs who see the value in our work and how we make a difference for people in our communities,” Ms Rodgers said. Ms Rodgers said it was important to highlight how the partnerships were working to deliver positive outcomes, and everyone agreed co-location, relationship building and trust, and regular access to an Invisible Hurdles lawyer were main ingredients for the project’s success. The Invisible Hurdles health justice partnership project received funding through the Victorian Legal Services Board Grant program, and Legal Aid NSW also provides funding for the project to be run at AWAHS. Representatives from NESAY, Wodonga Flexible Learning Centre and AWAHS outlined how the Invisible Hurdles was helping young people, particularly in family violence situations, as well as creating other benefits for service workers, such as upskilling and education on the legal system. NESAY executive officer Leah Waring said the health-justice partnership had created a positive ripple effect and helped enhance relationships, while giving support workers new skills. Ms McGowan praised the Invisible Hurdles partners for their collaborative approach to address legal problems for young people in vulnerable situations and encouraged them to continue showing Government how the service model was working. Invisible Hurdles project partners gather to discuss the success the program has created through helping young people with Member for Indi, Cathy McGowan AO MP(middle).